Charlie Cox as Matt Murdock in Daredevil. Despite all the larger-than-life twists and turns he’s dealt with, Matt Murdock’s always been a relatively grounded man within the Marvel Cinematic Universe thanks to his unwavering faith. In the third season of Daredevil, though, Matt’s faith is going to be put to the test in a way that takes him to his darkest depths. io9 found out all about it during a set visit to the Netflix superhero series. The world is convinced that he died after the events of The Defenders, so Daredevil’s third season finds Matt at a unique impasse that gives him the opportunity to reflect on his life as a vigilante and whether all of the turmoil he’s put himself through is worth it. Beaten, bruised, and alone, there’s little Matt can really hold onto other than his faith. This reality puts him in a head space that’s going to bring new elements of his personality to light and push the show deeper into the psychological aspects of Daredevil’s larger mythos. For a significant chunk of the new season, Matt’s back in black duds that, on passing glance, are more or less the same as his classic black outfit. 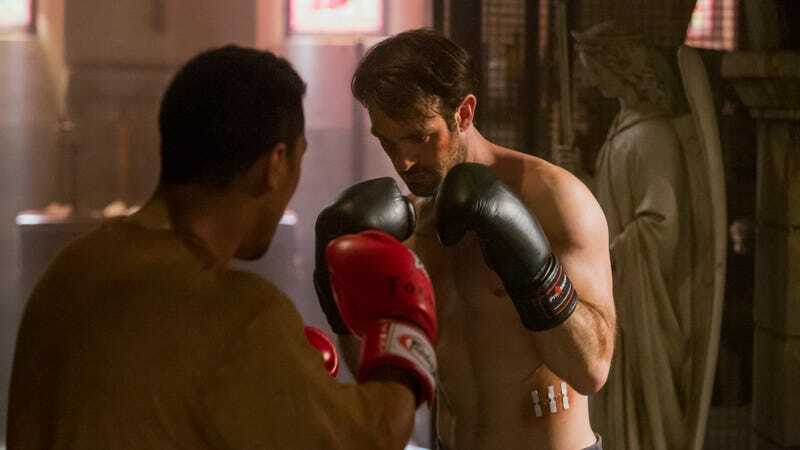 But when we spoke with Charlie Cox during our recent set visit, he explained that there’s a much deeper significance to this iteration of the black costume that factors into the story Daredevil’s third season will tell. “The way we transitioned into the red costume at the end of season one, the thing that really sold it for me was the conversation Matt had with Father Lantom. Lantom says ‘Sometimes it’s important for there to be a symbol to be feared by people.’ It keeps them in check, it allows them to remember why they behave in a moral way. That was the impetus for Matt to go and embrace this symbol—that iconic red suit. “He still believes in God, but he believes in a punishing God. He sees God as, at times, quite cynical and almost vindictive. Hopefully, he’ll come back from that, but early on, at least, he’s that angry. He feels that let down. If you’re someone who believes he was given this gift in order to help, and then that is taken away but you’re still alive, it throws everything into question. Matt’s crisis of faith coincides with his return to the orphanage where he grew up and an unexpected reunion with new cast member Joanne Whalley (Willow), who portrays Maggie, a nun with an important connection to his past. Though Whalley was cagey with specific details about Maggie and Matt’s history, she emphasized that she and Matt will be somewhat at odds in terms of how they demonstrate their faith—but, regardless of their differences, she’s steady in her commitment to help the broken hero in whatever way she can. Daredevil’s third season will also see the return of Deborah Ann Woll’s Karen Page, whose proximity to Matt will once again put her a specific kind of danger. Woll explained that even though Karen finds herself in the midst of a battle she didn’t ask for, all of her past experiences with heroes and villains have made it so that by the time we catch up with her, she’s more than prepared to take on whatever comes her way. “The main thread that I asked every single showrunner along the way was like, ‘Please don’t say I shot someone to save a busload of kids.’ I want whatever happened to be something that was my fault. That this isn’t a story about misplaced guilt, this is a story about forgiveness and acceptance. Between Wilson Fisk getting out of the pokey and everyone assuming the Devil of Hell’s Kitchen is dead, Daredevil is set to take more than a handful of dramatic turns when the third season drops October 19.